What is Double Knitting Anyway? Complete Ravelry thread found here, Double the Fun KAL 2013. Everyone ready for another knit along with us at Polka Dot Sheep? I hope you are excited as me about learning a new technique as me. Come and learn double knitting with us! On to choosing yarn…my first recommendation is to use the same yarn for each side. For example, I am using Malabrigo Worsted. Then decide on colors. This is a great project to use a fun variegated yarn as one side. 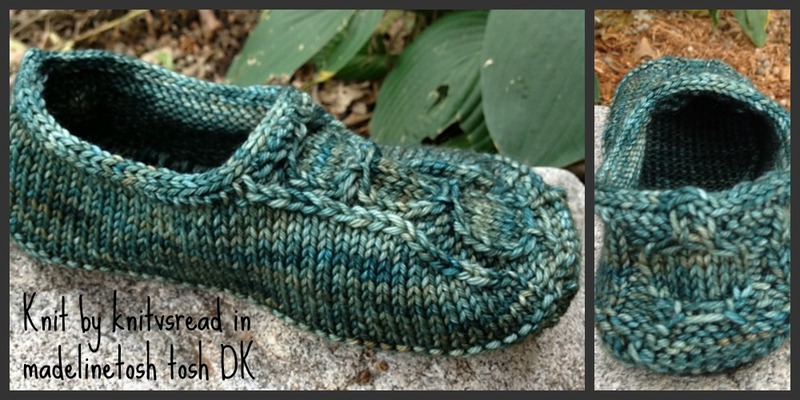 Pair that variegated yarn with a more solid color. Otherwise, the pattern might not show well at all. The best weight of yarn to achieve the gauge of this project and for a good fabric for excellent results is worsted weight, a yarn that normally knits up in stockinette stitch with 4 to 5 stitches per inch. You will need at least 200 yards of each color you choose. For many of the recommended yarns that will be two skeins, one of each color. But be sure to check the yardage of the yarns before you purchase them. Here are the recommended yarns for this project at the given gauge: Berroco Ultra Alpaca, Berroco Vintage, Berroco Vintage Colored (variegated Vintage) Malabrigo Worsted, Malabrigo Rios, Madelinetosh DK (a very heavy dk yarn) and Berroco Abode. We also stock the broadest colors ranges in several of these yarns. We have 47 colors of Vintage + 5 colors of variegated Vintage Colors for a total of 52 colors, 36 colors of Ultra Alpaca, and a whopping 76 colors of Malabrigo Worsted. VERY IMPORTANT INFORMATION …. with double knitting your gauge and needle sizes might not be what you would normally expect. With the double number of stitches on your needles, your gauge will be different. You might need to go down in needle size(s) from what you would normal use to get the same gauge in stockinette stitch. So you must swatch in your chosen yarn to get gauge and achieve a fabric where the opposite side does not show through. There is no way around this step in this project. This is also why it is much easier to use the same yarn for each side. Jennifer O. (twincomet on Ravlery) will be my partner in knitting. I am so glad she is on board. She is an excellent knitter and has a great eye for color. Over in the Ravelry thread we will able to answer questions about color and yarn choices if you have them. There will also be a new feature for this KAL, an in store support class at the Knit ‘n Needle in Whitefish, Montana. If you join the support group, you will be able to receive personal help from Jennifer or Aimee. This not a traditional class since some of teaching for the technique will be here on the blog and in the KAL Ravelry thread. However, it is fun to meet together in person while knitting the same project. With specific expert knitting help available, there is something more than your standard knitting group. Along with technical support, Jennifer or Aimee will help you chose your yarn and colors. 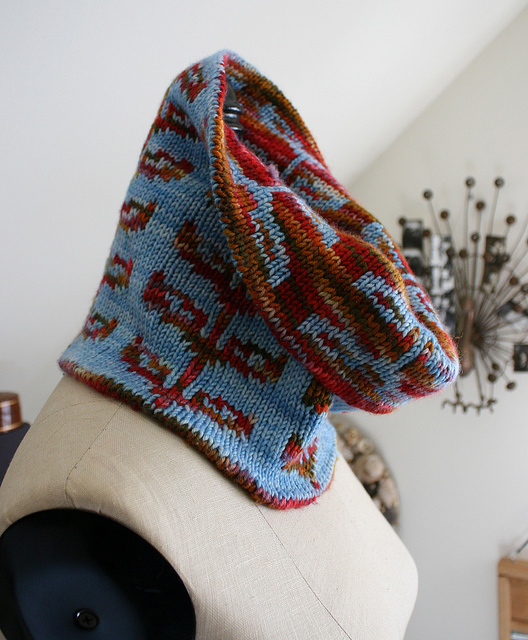 In store Double the Fun Sprout Cowl KAL class will meet on Mondays from 11 am – 12:30 pm. There will be three sessions, October 28, November 4, and 11. The cost will be $25 and you can attend as many of the sessions as you wish. The first session will focus helping you chose your yarn, getting the pattern (available in store) and working on gauge. However, simply knitting along with us here on the blog and on Ravelry is totally free. But I encourage you consider joining the class. We want to support all our customers both in person and on-line in the best way possible. Take a look at the recommended yarns and chose some fun colors. 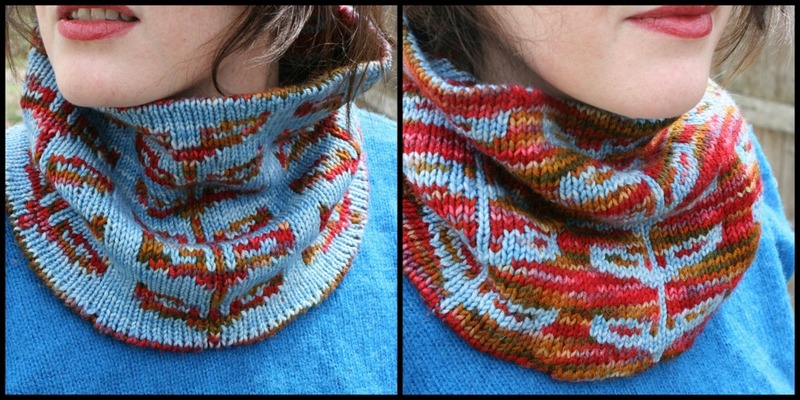 Your finished Sprout cowl is sure to gather compliments and keep you warm all winter. Toward the end of next week, I will talk about two color cast on and what you will be looking for when you swatch for this project. Come over and chat colors and yarns in our Ravelry thread for the Double the Fun KAL. If you live near to the Knit ‘n Needle Yarn Shoppe, stop in and get your pattern, yarn or sign up for the class. This has been a fun KAL. There are many toes that are currently warmer or will be when the slippers are gifted to them. I finished my slippers this past week. They really don’t take that long to knit but I knit several other projects during the past month as well to having family here. I really loved the pattern. Straightforward with a chart, I rated it five stars on Ravelry. But you came here to see finished project by KAL participants. As a note all names given are Ravelry user names. I have shared other finished projects here. You can read our chatter and thoughts on Ravelry in the Warm Up Your Toes KAL thread. If you are reading this post now that the KAL has ended, the Ravelry thread is a great place for information as well as the following blog posts in the Warm Up Your Toes KAL…1st, 2nd, and 3rd posts. Thanks for joining us in this KAL. 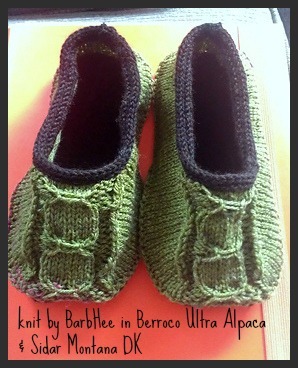 I encourage you to knit these little slippers. They are pretty quick, great for those times you just have to cast on a new project, and a great gifting project. It is likely you won’t knit only one pair. I have at least one more pair planned for Christmas gift and maybe more.